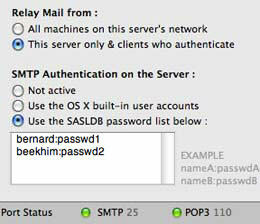 All you need to do is to tell Postfix which domain it is supposed to receive mail for. You enter the domain name into MailServe's Domain Name field, as shown below, and Restart Postfix to make the setting "stick". 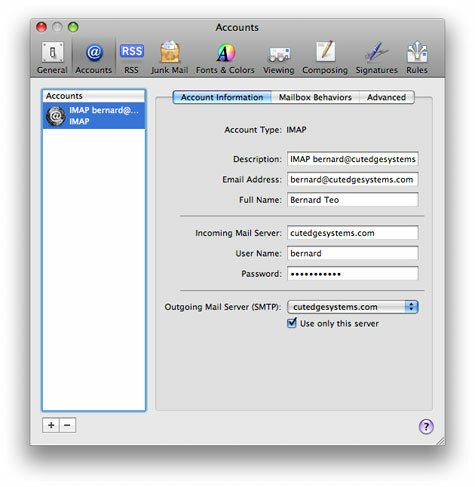 The job of providing a view into these stored mail for every mail user is done by Dovecot, which provides both a POP3 and an IMAP server, and which you can turn on at the Dovecot panel. (IMAP is recommended because it provides the user with a user-definable folder/sub-folder structure). 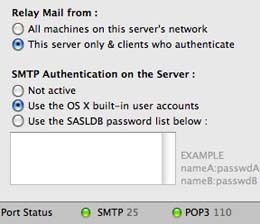 Since the server, in this case, is set to relay mail from all machines on the local network, no authentication is required when we're setting up the Outgoing Mail Server. 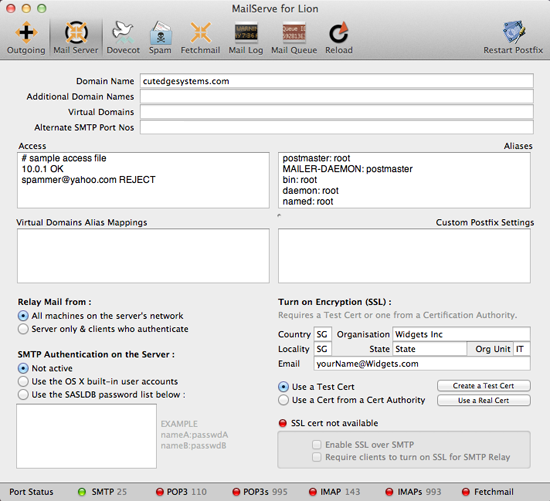 MailServe create these SSL certs in /System/Library/OpenSSL/. 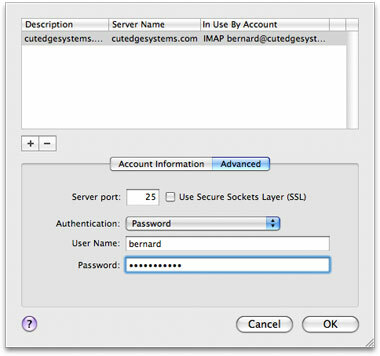 The cert is in the certs folder and the private key can be found in the private folder. You can replace the test cert with a "real" cert that you buy from a Certification Authority (CA). 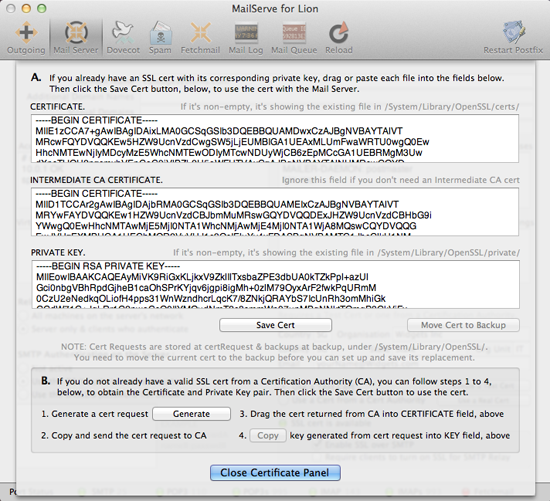 MailServe includes a streamlined interface that can help you request for a cert from a Cert Authority and then help you pair the returned cert with its original private key (that was created at the cert request stage). You can also use this panel to save a pre-existing cert for use by your mail server (and your web server if you use WebMon to set up the web services). 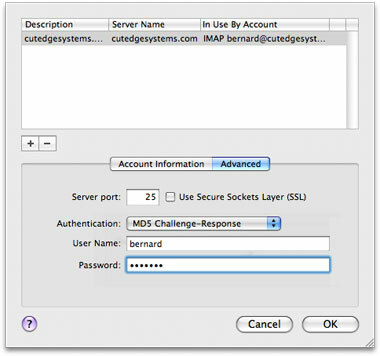 Just drag the certificate and key portions (either from text files on the Finder or text blocks copied from another application or the web browser) and place them into their respective fields. Then hit the Save Cert button. 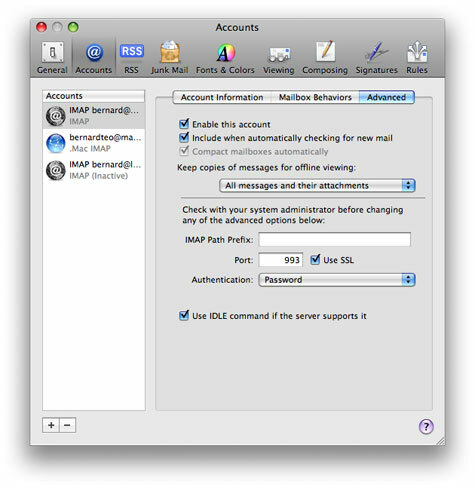 New in MailServe for Lion : the user interface now allows you to insert an Intermediate CA cert, if that is required by your Certification Authority. 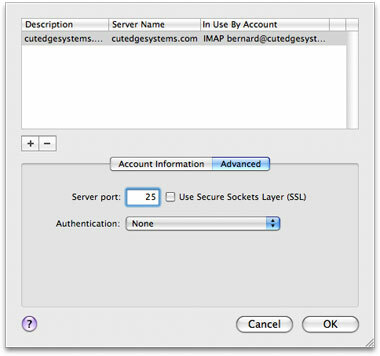 When you close the cert management dialog box, MailServe will be able to detect that a "real" cert is available for use and so allow you to turn on the SSL-related controls.